It’s Always Sunny in Philadelphia: Cancelled or Renewed for Season 14 on FXX? Could this be the last call at Paddy’s Pub? Has the It’s Always Sunny in Philadelphia TV show been cancelled or renewed for a 14th season on FXX? 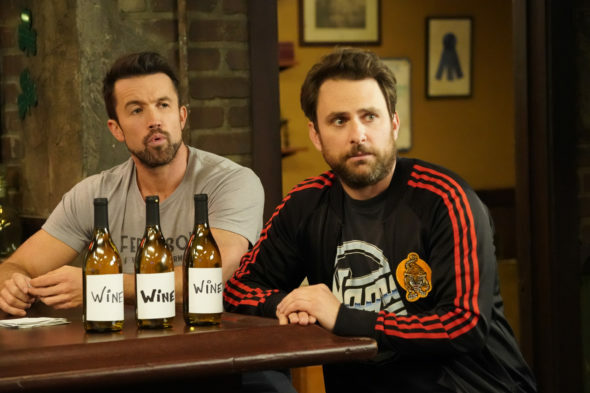 The television vulture is watching all the latest cancellation and renewal news, so this page is the place to track the status of It’s Always Sunny in Philadelphia season two. Bookmark it, or subscribe for the latest updates. Remember, the television vulture is watching your shows. Are you? Airing on the FXX cable channel, It’s Always Sunny in Philadelphia revolves around five underachievers who run Paddy’s Pub in South Philadelphia — Mac (Rob McElhenney), Dennis (Glenn Howerton), Charlie (Charlie Day), Dee (Kaitlin Olson), and Frank (Danny DeVito). In season 13, the gang is back together — sort of. Dennis takes on the new role of father in North Dakota while his buddies continue their scheming ways at the bar. Could they be happier and more successful without him? Even without Dennis, the gang still has its hands full: Charlie hopes to have a child with The Waitress, Mac wants to understand his newfound sexuality, Dee takes feminism to new heights, and Frank is intent on the Gang experiencing the greatest moment in Philadelphia sports history — an Eagles Super Bowl victory. The 13th season of It’s Always Sunny in Philadelphia averaged a 0.22 rating in the 18-49 demographic and 366,000 viewers. Compared to the season 12, that’s down by 40% in the demo and down by 39% in viewership. Find out how It’s Always Sunny stacks up against the other scripted FXX TV shows. On April 1, 2016, FXX renewed It’s Always Sunny in Philadelphia through season 14. Could that be the end? Stay tuned for further updates. Despite low ratings, It’s Always Sunny in Philadelphia continues to be renewed year after year. While the FXX won’t cancel this sitcom before the end of season 14, I’ll still keep an eye on the ratings. Sometimes, if a show really tanks, a network can reverse their renewal decisions. Considering the current ratings, I don’t see that happening right now. Check the rankings for the scripted FXX TV shows. Find more It’s Always Sunny in Philadelphia TV series news or other FXX TV show news. What do you think? Do you think the It’s Always Sunny in Philadelphia TV show will be renewed beyond season 14? When should this FXX comedy series end? It’s Always Sunny in Philadelphia: Season 13; FXX Series Returning without One Cast Member?